In the town of Morganville, vampires and humans live in relative peace. Student Claire Danvers has never been convinced, though—especially with the arrival of Mr. Bishop, an ancient, old-school vampire who cares nothing about harmony. What he wants from the town’s living and its dead is unthinkably sinister. It’s only at a formal ball, attended by vampires and their human dates, that Claire realizes the elaborately evil trap he’s set for Morganville. Yet another awesome installment in the Morganville Vamps series! (And that cover is H-O-T.) This series is honestly one of my all time favorites, I haven't been disappointed yet! There's more suspense and action in this book, because now Bishop is mixing things up and causing lots of deadly trouble for Morganville. I really don't care much for Bishop since he's the bad guy here, but his character seems intriguing. He's not one of those 'evil villain' types that is just there to be an obstacle. He adds to the story immensely. The whole cast of characters is on-par as always. Claire continues to grow and mature. I often forget that she's only 16 from the way she handles all the insanity and life-threatening danger in a rational way. Michael, Eve, and Shane are still as awesome as ever; and yep, Shane is still a major hottie. My favorite character by far, though, is Myrnin. He's so... eccentric and insane! He's unpredictable, so reading about him is like walking a tight-rope. 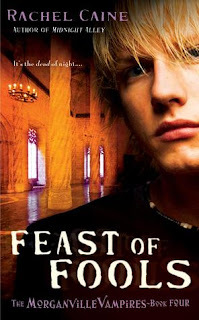 If you've read the previous books, but not Feast of Fools yet, then go and read it soon! Definitely awesome. 5 out of 5. I just bought this one from the Borders closing sale, I haven't had the time to read it yet, but now I'm really looking forward to it :D Great review! I definitely need to continue on with this series - I've only read the first book so far, which I really enjoyed! I've heard great things about the rest of the series and I love that there's a ton of books, already released (no torturous wait! ), ready for my to devour. Great review! @April X, read it ASAP! :) I want dot go to the Borders closing sale, but it was over before I even realized, lol. I guess I'll need to try this series. Great review!